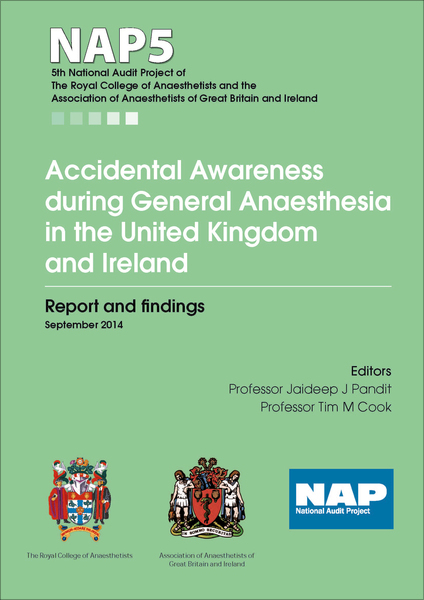 NAP5 examined the topic of Accidental Awareness During General Anaesthesia (AAGA), selected after an open call for proposals, peer review and shortlisting. 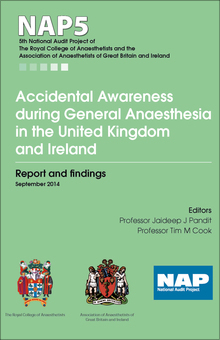 For NAP5, the RCoA was joined by the Association of Anaesthetists of Great Britain and Ireland (AAGBI). The project has also, for the first time, expanded the NAPs into Ireland with the support of the College of Anaesthetists in Ireland. How many patients (in a defined national population) spontaneously report AAGA? How do these patients present: when, to whom and how? What do patient stories tell us about patients' experiences and expectations soon after an episode of AAGA (and do these change with time)? Is specific depth of anaesthesia monitoring used and does it alter incidence of AAGA? To develop strategies for prevention of AAGA. To identify an optimal process for managing cases of explicit awareness. To acquire further knowledge of AAGA that can be used by anaesthetists when informing patients and consenting for anaesthesia. NAP5 received more than 400 contacts from individuals wishing to report cases of AAGA. Delay in reporting ranged from none to up to 62 years after the event. The estimated incidence of patient reports of AAGA was ~1:19,000 anaesthetics. However, this incidence varied considerably in different settings. There was a wide range of patient experiences and a wide range of psychological consequences (from none to life-changing). Most reports were short in duration, the vast majority lasting <5 minutes. Longer-term psychological effects were identified in approximately half of patients reporting AAGA.